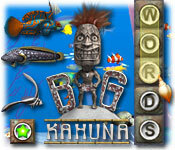 Big Kahuna Words is rated 2.6 out of 5 by 7. Rated 5 out of 5 by devouread from TRY IT~ YOU'LL LIKE IT!! ;} This is a game I play almost every day for keeping my brain active!! People who don't know how to spell or care little about their spelling ability probably won't like it...or find any challenge to it. The scores are the goal...and the longer the words, the better the scores. 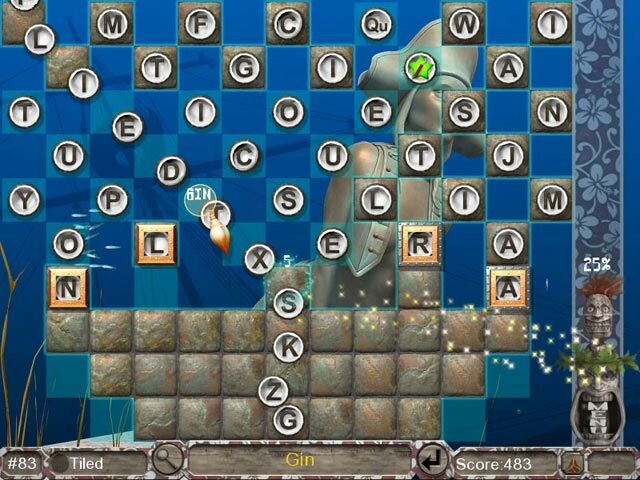 The relaxed mode allows all the time you need to find those awesome 10 or longer lettered words for the awesome scores. The neatest thing about this game also is the back ground that allows you to collect fish to add to a constantly moving aquarium full of beautiful fish....its worth it to just watch the fish at any point in the game! ;} The tutorial is lame and it makes you go through it whether you want to or not...but after you get past that it gets increasingly better and trickier. [is that a word?~lol] For a fun and relaxed word-finding game that really tweaks the brain~ here you go!! TRY IT~ YOU'LL LIKE IT! Rated 5 out of 5 by chabchab from Pay no mind to the youngsters Long time game available on the Windows side only. It's also a game for people that find it challenging to make up words IN ANY DIRECTION with as many letters as possible. This isn't meant to be an arcade game. Relaxing with a challenge if you want to be. If you liked the match 3 game (not the #3 game though), you'll like this. Rated 4 out of 5 by RyeMcLaughlin from Worth a try I was surprised at how much I liked this older game. The graphics are clear. The game plays smoothly. It can be played in Relaxed or Timed modes and you can switch between each. 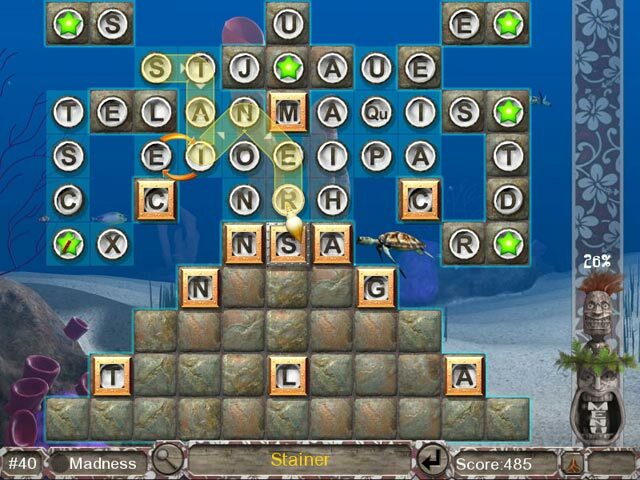 In this game you chain the letters to make words. You can go in any direction, but each letter can be used only once. You can also switch the position of one set of adjoining letters per word made. The letter are on a grid like a match 3 and you have to clear tiles to clear a level. Some tiles must be cleared twice. There are starred tiles that can be any letter. Some letters are locked - these must be used as the first letter in a word. The tile still needs to be cleared after you break the lock. There are also bonus words, these give you bonus points. If you make a word of 6 letters or more you are awarded with bombs of varying strength. There is a volcano on the lower right of the screen. This will allow you to clear the whole board. 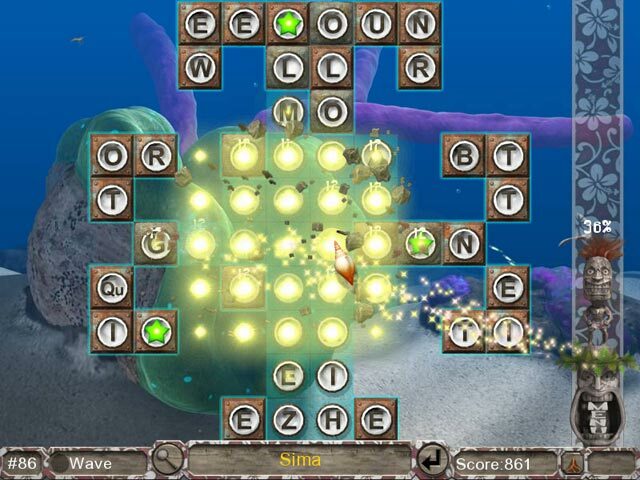 Like the other Kahuna games, you also unlock fish to swim in the background. You can fill your screen with lots of them or only have a couple. It's a nice extra touch. The tutorial is voiced by a surfer dude. He's kind of amusing/annoying. He pops up each time there is a new feature, but doesn't waste too much of your time. Lots of replay value to this one. Give it a try if you like word games. Rated 1 out of 5 by chi_love from Pass on this one When I saw "Big Kahuna" I thought it would be along the lines of the addictive match 3 game play of Big Kahuna Reef but in a fun word game. Not so much. Maybe it would be good for a child to develop spelling skills but that's about it. Rated 1 out of 5 by sallyg0104 from Wish it had worked! Love word games, but definitely better ones out there. Could not get the game to do what it was supposed to do during the tutorial and the tutorial itself was confusing. Did not explain, in any way, what the end purpose of the game was and I got frustrated enough with it that I didn't even finish the tutorial. Graphics reminded me of an old PC typing program that my son used ages ago to learn to touch type faster. Really disappointing. Like I said, I really did want this to be a fun word game. Rated 1 out of 5 by onhisvine628 from Don't waste your time. Boring! This is the most boring game. Bookworm is much better. The tutorial went on forever and there was no way to get to the actual game. The menu icon was very hard to see. Rated 1 out of 5 by Batstrings from Back to the 80s Wow this game is all around dull. From the graphics to the lack of challenge I was bored. It's overall feeling is an old 80s game revamped to work on a modern system. This is one of the worst games I've played in a long time.